It wasn’t until recent times, until after I had spent over twenty years as a ten precept nun, that bhikkhuni ordination in Australia became feasible. Women have had enough faith and fortitude to survive on the fringes of the Sangha for generations. They did not need further assistance to do just that. What they did need though was for the monks (as the ones who hold the legal authority), to realise the opportunity they have in the contemporary world, to transform the situation and again open up full membership of the Sangha to the other half of the Buddha’s disciples. I am humbly grateful to Ajahn Brahm, Ajahn Sujato and the Sangha at Bodhinyana Monastery for acting with wisdom and compassion to courageously use their authority for the benefit of countless beings. I bow with respect and gratitude to Ayya Tathaaloka and the other Bhikkhunis who took part in the ordination ceremony out of faith and kindness, and at some disadvantage to themselves. I feel appreciation and gratitude for the support and encouragement of our lay friends. We couldn't have done it without your help either. May you all share in my happiness. The journey began with a simple and sincere aspiration - an aspiration to commit my life totally to the Buddha Dhamma and Sangha, a wish to follow closely in the footsteps of the Buddha for the attainment of Nibbana. After the ordination I wasn’t feeling on top of the world or jumping up and down and screaming with joy. Nothing like that. But I felt very humbled by the experience and very inspired and grateful.. As I chanted in the ordination ceremony (ullumpatu ayya, anukampan upadaya) I felt I was being raised up by the sangha out of compassion. The ordination took the journey to a deeper level of commitment, faith and confidence in the path of practice. I was inspired by the courage and devotion of the bhikkhu and bhikkhuni sangha towards the truth, in honouring the Buddha’s wish to have the four fold assembly in his dispensation - bhikkhus, bhikkhunis, laymen and lay women, as the Buddha himself established 2500 years ago. I’ll cherish this beautiful gift of ordination given with care and support from the monastic brothers and sisters in the Sangha. I also felt tremendously humbled by the experience. The ordination was the result of years of hard work, struggle and pain and frustration of lots of practitioners, monastic as well as lay practitioners, and the support of sangha and lay practitioners of BSWA. The conditions for ordination were ripe at this time because of your faith and confidence in Dhamma and Vinaya and your kindness and generosity. I am very honoured and grateful to be part of this beautiful and inspiring process. I will cherish this beautiful gift of ordination - a gift of faith, confidence and courage and devotion to Dhamma and Vinaya, a gift of compassion, kindness and generosity from the Bhikkhu and Bhikkhuni sangha as well as all the supporters on the path of practice. May I share merits with all of you, and may this help us all in the attainment of Nibbana. And both Sanghas present DID. How to express the CHANGE, the gratitude, joy, deep peace, depth and support, the blessings felt, ever since then! TRULY FEELING FULLY ORDAINED, UPLIFTED. ‘BHIKKHUNI’ is not felt as a title in itself, BUT as a total and complete COMMITMENT and RESPONSIBILITY, A SPIRITUAL BEING. When factors are fulfilled so are the outcomes. After having taken the full ordination, the ‘upasampada’, it really has given me a sense of at last my good wishes are being fulfilled. Being a monastic I always have a very strong sense of duty and responsibility to fulfil the vinaya precepts. Some people have said it doesn’t matter whether you are a bhikkhuni or not as long as you keep it in your heart. In the past I had the same mentality too, until some time ago. I realised that it doesn’t actually work. 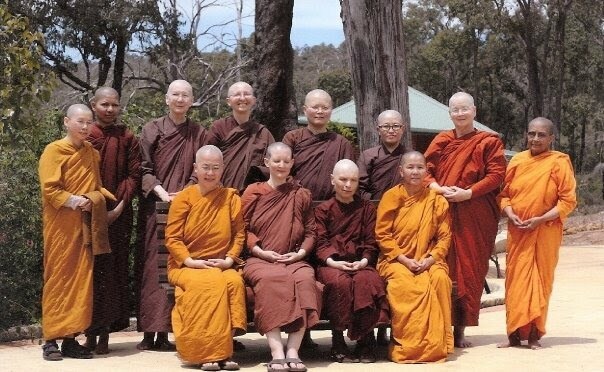 As many supporters of Dhammasara Nuns’ Monastery know, the nuns from Dhammasara have been upholding many more precepts than just the ten precepts. Some time ago when I went back to Malaysia to visit my family I met a senior monk trying to tell me that as a Ten Precept Nun or Samaneri I do not need to keep those rules. I felt that trying to keep 311 Patimokkha rules as a Ten Precept Nun that people would think you are crazy or making a big fuss. Recently I have been reflecting on one of the discourses from Majjhima Nikaya 6. It really gives me lots of joy and happiness. “Bhikkhus, dwell possessed of virtue, possessed of the Patimokkha, restrained with the restraint of the Patimokkha, perfect in conduct and resort and seeing fear in the slightest fault, train by undertaking the training precepts.